In a review meeting CM Pema Khandu expressed concern on the delay in execution of the TAH project, especially on the Potin-Pangin stretch. 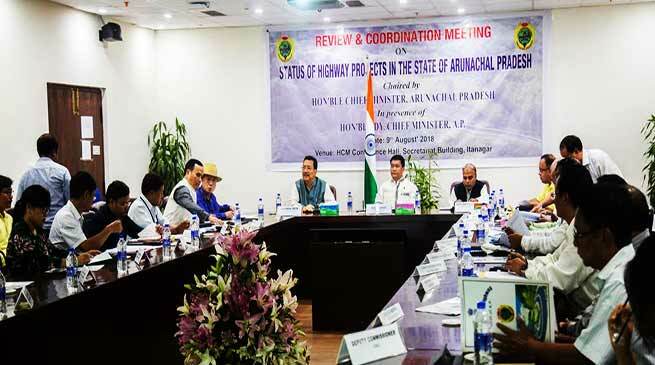 Chief Minister Pema Khandu along with Deputy Chief Minister Chowna Mein, who also holds the PWD portfolio today took a review on status of all highway projects in Arunachal Pradesh. Top officials of the state including the Chief Secretary and all deputy commissioners were present in the meeting along with officials from the forest department, land management, PWD, PHED, BSNL and representatives from NHIDCL and MoRTH. The Chief Minister urged everybody to speed up all the process like land acquisition, forest clearance, tendering and execution of all highway projects in the state. He particularly expressed concern on the delay in execution of the Trans-Arunachal Highway project, especially on the Potin-Pangin stretch. While discussing on the 4-lane Hollongi to Banderdewa road, Khandu asked the Highway departmental officials to continuously follow up with the Concessionaire so that the Phase A of the sanctioned project is completed on time. He also requested the MoRTH to complete the sanctioning process for the Phase B and C as soon as possible. “The state government is drawing flaks from the people for the Potin-Pangin stretch of TAH and the 4-lane road in the state capital. We should take these criticisms in the right sense and tighten up our belts. Citizens cannot be allowed to suffer for no fault of theirs,” he said. Khandu requested the MoRTH and NHIDCL representatives to convey the need and urgency of the highway projects to their authorities so that approvals and sanctions are granted as early as possible. To the delay caused in some portions of the highway projects due to land acquisition, Khandu asserted that at works must begin on the stretches where 80% acquisition has already been done. He said the entire project should not get stuck due to problems in few stretches and assured full cooperation from the state government. The Chief Minister directed the deputy commissioners to follow up with the Concessionaires and resolve all issues faced by them in executing the projects. Mein too expressed concern over the delay on the Potin-Pangin stretch, particularly in Lower Subansiri, and asked the deputy commissioner to submit his reports on assessment at the earliest. He said the ‘investigation’ part on alleged misappropriation will independently continue but the entire project should not be affected. National Highways & Infrastructure Development Corporation Ltd (NHIDCL), under the Ministry of Road Transport & Highways (MoRTH), which is undertaking major chunk of highway projects in the state, presented in detail the issues being faced in certain portions of the projects, which were then clarified and resolved by the concerned deputy commissioners and forest and land management officers. Satyabrata Sahu, Director (Finance/Admin), NHIDCL, assured cooperation while confirming posting of two more general managers to oversee the projects in Arunachal Pradesh. The meeting also discussed on the proposed East-West Industrial Corridor to connect all the foothill areas and the Arunachal Frontier Highway to connect the border areas in the upper reaches of the state.